This day involves a transfer hike from Çerem to Doberdol, a remote shepherd’s village accessible only by mule tracks and populated only during the summer time by shepherds. 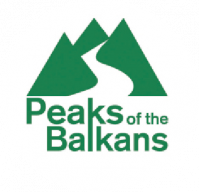 From Çerem, the hike climbs up to the Montenegrin border, passes the beautiful summer shepherd’s village of Balqin, and continues through the Gashi valley (protected area) to the shepherd’s village of Dobërdol. The main attractions in Dobërdol are the glacial lakes of the Doberdol-Sulbices plateau. This trail can be separated perfectly into two days hike by having an overnight stay at the picturesque summer shepherd’s village of Balqin (WP 8b) which is located almost in the middle of the trail. The first day hike is 9.1 kilometers and the second day is 6.5 kilometers long. You can either camp there or ask the shepherds for a shelter. Fresh food can be bought directly from them. There are a number of springs and streams along the trail which are safe for drinking. The hike starts at Cerem center (WP 7a) and continues northeast on a gravel road along the Markafsha stream. At WP 1b, we cross the stream and follow the mule track which enters the forest and zigzags upwards. The path exits the forest at WP 2b and follows northeast through a beautiful meadow with breathtaking views towards Çerem. The track is easily identifiable by a slight depression when the grass is long and very easy to follow because the meadow is lined by the forest leading you to the gravel road (WP 3b). The ascent softens as we follow the gravel road through the forest for approx. 2.5 kilometers. Our route turns left at the junction (WP 4b) and we leave the gravel road at the border pyramid (WP 5b). 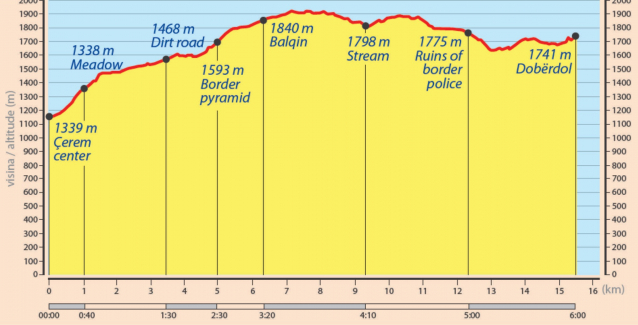 From the border pyramid, our track continues along Montenegrin territory for approx. 2.5 kilometers by following an easily identifiable, gently ascending mule track northeast through the forest. At WP 6b, we reach a nice meadow and can see a small building on our left which had been used as a survey point by the border police. We take a right turn at the junction, and as our path enters the forest, after several meters, the ascent starts to become steeper. We bear right at the junction of WP 7b and after approx. 100 meters we meet a dirt road. A few meters ahead, on our right side, another border pyramid is located. We cross the dirt road and follow the mule track northeast, passing through the forest until we reach Balqin (WP 8b), a beautiful shepherd’s village also used only during the summer time. Balqin is an inviting place to take a rest and get to know a little more about the locals’ culture. a water source (WP 11b). The ruins of the border police office can be seen a few meters off to our right side. From here, one path descends to the Gashi valley, while another one climbs up to the border. We follow north along the descending path to the valley and a few meters further on we make a left turn at the junction. At WP 12b, the path starts ascending (from 1660 to 1760) and afterwards the hike through the beautiful meadows of Dobërdol is flat along the river. Dobërdol is a good option to spend a day at and have a relaxing hike to the glacial lakes located a few kilometers southeast. You can stay overnight at the mountain hut (WP 13b) which is managed by a local family for touristic purposes.